Mayer Plumbing offers a wide range of plumbing services to meet your every need, large or small. We are ready to assist you with any emergency or project. Our seasoned technicians come ready to handle most problems on the spot saving you time and money. We serve residential and commercial customers. How do I deal with leaky faucets? Leaky faucets can be both annoying and a preventable waste of money. Most leaks occur commonly in faucets, pipe joints and the toilet. Anyone can follow a few simple plumbing steps to solve this common household problem. Look closely at where the leak is centralized. Is the drip in the faucet or could it be that the water is leaking in the handle? Always start any plumbing repairs by turning off water shut off valve to your home so you can work on the pipes without water flowing through them. How do I fix faucet leaks? Bathroom and kitchen faucets will often leak due to the washer or O-ring wearing out. Washers are made of rubber and sometimes metal. The washers are discs that seal and restrict the flow of water when the handle is turned. This type of faucet is known as a compression faucet. To replace a washer, remove the decorative cap by screwing it off or pulling it depending on its design. Next, unscrew the packing nut that holds the valve in place by turning it counter clockwise. Value washers come in many various sizes and shaped. I would suggest that you take the valve stem with you to the hardware store to add in matching the exact size needed to the old washer. After replacing the washer if your faucet still leaks, the seat may have been damaged. How do I fix a damaged valve seat? If the washer has become worn prior to replacement, the metal will grind against metal and damage the valve seat. Water particles and mineral deposits can become trapped between the seat and the washer so that closing and opening the faucet handle grinds the particles inside and damages the seal beyond simple washer replacement. Hardware stores have a seat-grinding tool that is commercially available for do-it-yourself home repair. The tool comes with easy steps on hoe to reshape the damaged seat to accept the new washer properly. How do I fix pipe joint leaks? Leaks along a pipe joint are the easiest to locate and generally the fastest to fix. Pipe clamps are an effective way to temporarily fix a leaking pipe and come available in a repair kit. They consist of a neoprene sleeve and screw hinge. You insert the rubber gasket the kit between the pipe and the clamp and slowly tighten the screws until the leak stops. Manufacturers suggest this method of repair will last 5-10 years. Another way to patch a leak on a pipe joint is to apply plumbers’ two part epoxy putty around the leaky joint. This method is not as effective as a line-clamp repair made on a straight section of pipe and will not make a proper bond if your pipe is rusty. If your pipe is leaking more than an occasional drip the problem is more serious and you may need to call a professional plumber. Do not assume that the leak will fix itself or diminish over time. 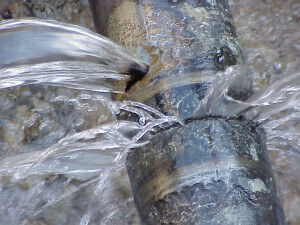 Leaks generally lead to bigger problems and could result in an expensive repair bill if not taken care right away.